Intel has released a new version of its Linux Graphics Drivers Installer and with it, the installer is now available for Ubuntu 13.04. For those who are not familiar with the Intel Linux Graphics Installer, this a relatively new tool created by Intel that lets you easily install the latest video drivers for Intel hardware. The installer consists of a GUI tool and a repository that's automatically added and then used to install / upgrade new driver versions. The installer includes the 2013Q1 Intel Linux Graphics Stack Release, which brings full Haswell support, OpenGL ES 3.0 support and many new OpenGL extensions and is available for Ubuntu 13.04 and 12.10 as well as Fedora 18 and 17. 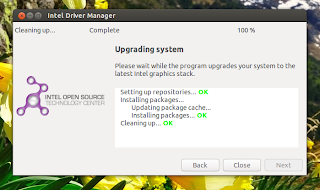 For what's new in the latest 2013Q1 Intel Linux Graphics Stack Release, see THIS page. 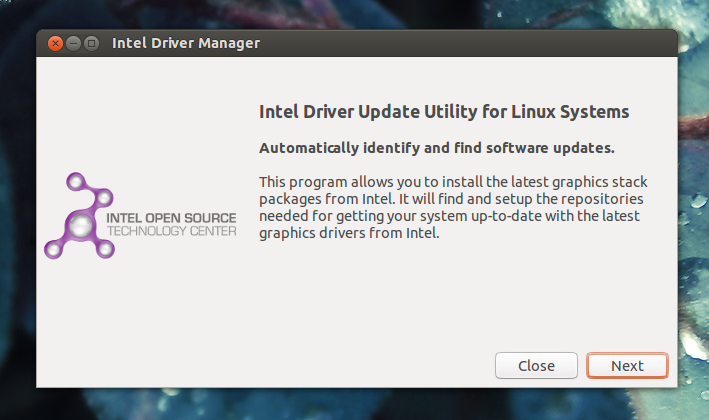 Oddly, Ubuntu 12.04, a long term support release, is no longer supported by the Intel Linux Graphics Installer. It seems the installer only supports the last two Ubuntu and Fedora releases and doesn't take LTS releases into account. "[...] The Installer is intended to empower end-users with our latest quarterly releases of the Linux* graphics stack. As the latest Ubuntu and Fedora releases age, they may not keep up with our quarterly graphics stack releases. Quarterly releases may include power, performance, and functionality improvements, things that consumers want. The Installer works with supported distributions' package managers to keep up with our quarterly releases. Our quarterly releases are tested and validated internally here at Intel's Open Source Technology Center. The Installer only updates packages that are older than those in the latest quarterly graphics stack release, or installs packages not provided by the supported distribution, e.g. libva-intel-driver that enables hardware video acceleration. The Installer does not track the "bleeding edge" or "the very latest", and it will not. It tracks our quarterly releases, which have been tested and validated internally." Before using the Intel Linux Graphics Installer, make sure you read all the notes on its download page! If you have questions about the installer or Intel Linux graphics, visit the Intel Linux Graphics forums. Download Intel Linux Graphics Installer - available for Ubuntu (13.04 and 12.10) and Fedora (18 and 17). The installer only works in Ubuntu or Fedora and doesn't work in derivatives, so if you're using Linux Mint 15, the installer won't work, but there is a way to use it - see THIS article.